Picture an idyllic island. 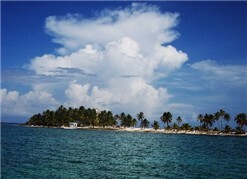 Then head for Half Moon Caye in Belize as it easily fulfills your dreams of a lush enchanted isle. Coconut palms sway in the breeze. The offshore reef is a cornucopia of colorful fish and coral. Beach goers sink into soft, deserted sands. And nature lovers hike forested trails and observe exotic birds -- including Red Footed Boobies On a recent Caribbean voyage on Silversea Expeditions' Prince Albert II, we sailed to this piece of paradise.